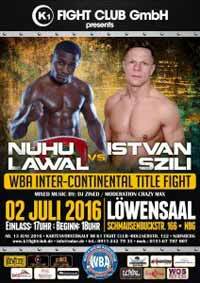 Review by AllTheBestFights.com: 2016-07-02, fight not particularly exciting between Nuhu Lawal and Istvan Szili: it gets two stars. The undefeated Nuhu Lawal entered this fight with a perfect record of 22-0-0 (12 knockouts) and he is ranked as the No.40 middleweight in the world. He has already fought once in 2016 winning over Soufiene Ouerghi. His opponent, Istvan Szili, has a boxing record of 19-1-2 (9 knockouts) and he entered as the No.78 in the same weight class. He suffered his only loss when he faced Antoine Douglas in 2015 (=Douglas vs Szili), after this bout he came back to win in 2016 beating Mazen Girke. Lawal vs Szili is valid for the vacant WBA Inter-Continental middleweight title. Watch the video and rate this fight!